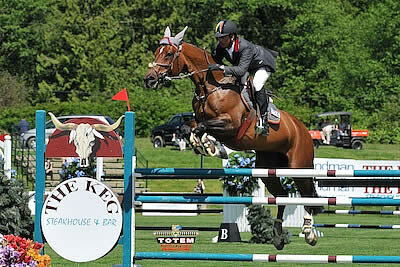 Langley, BC, Canada – June 8, 2010 – In another strong week of competition, Pablo Barrios of Wellington, FL, finished second in the $55,000 BC Open World Cup Grand Prix on Saturday, June 5, at the BC Open Tournament at Thunderbird Show Park in Langley, British Columbia, Canada. Barrios rode G&C Quick Star 11, owned by G&C Farm and Gustavo and Carolina Mirabal, to the top placing. G&C Farm’s state-of-the-art jumper facility is based in Wellington, FL. In the jump-off, Barrios was chasing the winning time set by Rich Fellers and Flexible. “Unfortunately in the jump-off I had a rail down. I was trying to catch Rich’s time. I did it but had the second to last fence down. I ended up second because Ashlee Bond had the same rail down but wasn’t as fast,” Barrios recalled. The pair also finished fourth in the $30,000 Thunderbird Show Park Spring Classic Grand Prix, CSI 2*. There were 30 entries in the class. G&C Farm and Pablo Barrios will participate in five weeks of competition in Calgary, Alberta, Canada, for the Spruce Meadows Tournaments, beginning on June 9 through July 11. Please visit www.farmgc.com for more information on G&C Farm, their riders, and their horses.